20 August 2013, warm (25oC-ish) sunny day with little wind. On the western edge of Bredon Hill I was walking across an open grass field and could hear a whirring noise what I assumed to be a dragonfly to my right, nothing unusual, so I carried on walking and then there was a ‘thwack’ sound which I turned to watch and saw a dragonfly labouring across in front of me flying to the left of the path, gradually loosing height grasping something large and white. I watched where it landed 20m or so away on the open grass area so rushed over and 30 seconds later started taking photographs. 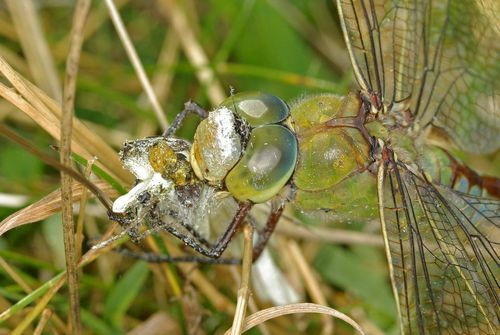 In probably less than two minutes from the initial catch, the meal was completed and off the Emperor Dragonfly went. 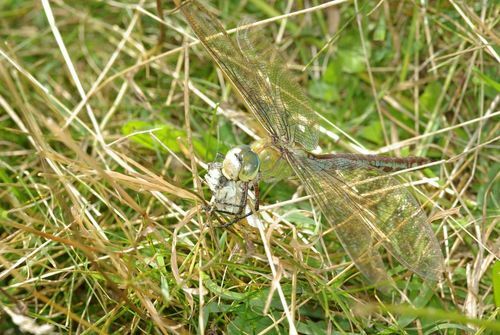 I never found the wings so which species of white butterfly it was I cannot confirm, but the size and the difficulty the dragonfly had in remaining air-borne suggests it was a Large White butterfly – ‘circumstantial evidence and not admissible as proof!’.